Right around the time I saw The Present on Broadway, I cam down with a killer flu and didn't get to write this review right away. By the time I sat down to catch up, I realized I was going to have dig out my notes on this adaptation of Anton Chekhov's Platanov, because I couldn't remember anything about it except that it starred movie star Cate Blanchett. Usually not being able to remember the plot of a show I just saw is a bad thing when it comes to review writing, but in this case, I blame it on Chekhov, who isn't a favorite. In fact, I rather enjoyed Andrew Upton's new take on the story, directed by John Crowley, which had me laughing out loud through a lot of it. Now that is something else unusual -- laughing during Chekhov, something I haven't done since Christopher Durang's Vanya, Sonya, Masha and Spike. This play isn't a sarcastic takeoff, it's just a rethinking of the original which includes some rather amusing moments. But don't miss a chance to see Blanchett in action. She makes even Chekhov watchable. The Present runs through March 19 at the Barrymore Theatre, 243 West 47th At., NYC. Performances are Tuesday and Thursday at 7 pm; Wednesday, Friday and Saturday at 7:30 pm; Saturday at 1:30 pm and Sunday at 3 pm. Tickets are $59-$159: thepresentbroadway.com. Variously known as Platonov, Wild Honey, Fatherlessness and The Disinherited, Anton Chekhov’s first play was not discovered until 1920, some 16 years after the playwright’s death. 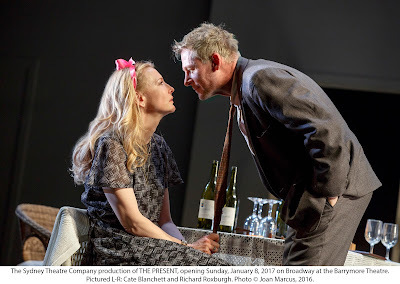 Andrew Upton’s adaptation is set post-Perestroika in the mid-1990s at an old country house where friends gather to celebrate the birthday of the independent but compromised widow Anna Petrovna (Blanchett). The show features the Sydney Theatre Company cast including Anna Bamford (Maria), Andrew Buchanan (Osip), David Downer (Yegor), Eamon Farren (Kirill), Martin Jacobs (Alexei), Brandon McClelland (Dimitri), Jacqueline McKenzie (Sophia), Marshall Napier (Ivan), Susan Prior (Sasha), Chris Ryan(Sergei) and Toby Schmitz (Nikolai). Credits: Set and costume design by Alice Babidge, lighting design by Nick Schlieper. Stefan Gregory is Sound Designer and Composer. A sweet revival of the Burton Lane musical adapted and directed by Irish Rep's Artistic Director Charlotte Moore starring Melissa Errico as Sharon, a young girl who in 1947, travels to Rainbow Valley, somewhere in the south named Missatucky. Her father, Finian McLonergan (a delightful Ken Jennings) wants a brand new life for his daughter and he thinks the stolen pot of gold he has brought with him from Ireland will make that happens. The pot's rightful owner, leprechaun Og (Max Sheldon) isn't happy about that, however, and follows Finian and Sharon to the USA. He finds love with Susan the Silent (Lyrica Woodruff, who performs Barry McNabb's ballet choreography gracefully in the small stage), sister of Woody Mahoney (Jeremiah James), who finds love with Sharon. There are some racial messages in the relationships with local sharecroppers and law enforcement officials and the pot of gold wreaks some havoc by granting unexpected wishes. Filling out the cast are William Bellamy as a Gospeleer, Alex May as Lilly Mae, Dewey Caddell as Senator Rawkins, Peyton Crim as Sheriff, Matt Gibson as Buzz Collins, Angela Grovey as Sallyann and Din Griffin, Kyle Taylor Parker, as Gospeleers. Errico is an enchanting Sharon and James is a handsome, dreamy voiced counterpart. Jennings is delightful as Finian, who seems almost a leprechaun himself. Set design James Morgan creates a lovely locale with columns, draping tree foliage and musical notes cascading across the backdrop. The four piece band is housed at the rear of the stage. The band on stage -- the pianist, who is very animated and obviously loves the score she is playing, mouths the words to the songs and is distracting. Sheldon is miscast and looks and acts nothing like a leprechaun, and the rather silly costume provided by Designer David Toser' doesn't solve the problem. 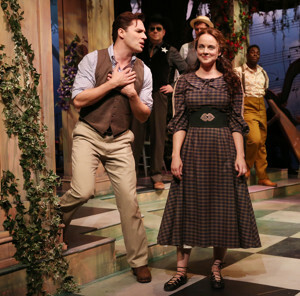 Finian's Rainbow has been extended through Jan. 29 at Irish Repertory Theatre, 132 West 22nd St., NYC. Most performances are sold out. Performances are Thursday at 7 pm; Wednesday, Friday and Saturday at 8 pm; Wednesday, Saturday and Sunday at 3 pm. Tickets: 212-727-2737; www.irishrep.org. Lighting Design by Mary Jo Dondlinger; Music Supervision by John Bell; Dialect Coaching by Stephen Gabis.